Zappos shoe boxes. Photo by Vickie Bates. Say you’re visiting Las Vegas…what’s top of your list of Fun Things To Do? Mine was: Tour the corporate headquarters of a successful company and learn how it translates its values into exceptional customer service and employee culture. Okay, so my priorities may be a bit different than yours, but when the company is Internet shoe and fashion sensation Zappos, I leapt at the chance. A couple years ago, I read Delivering Happiness: A Path to Profits, Passion and Purpose by Zappos CEO Tony Hsieh. It was interesting to understand his perspective about why a culture, created by employees, works better and has such a strong effect on the bottom line compared to cultures imposed from the top-down. As you can imagine, I was on board from the get-go, especially when I saw this sign (click on any photo to enlarge), taped to an employee’s cubicle. 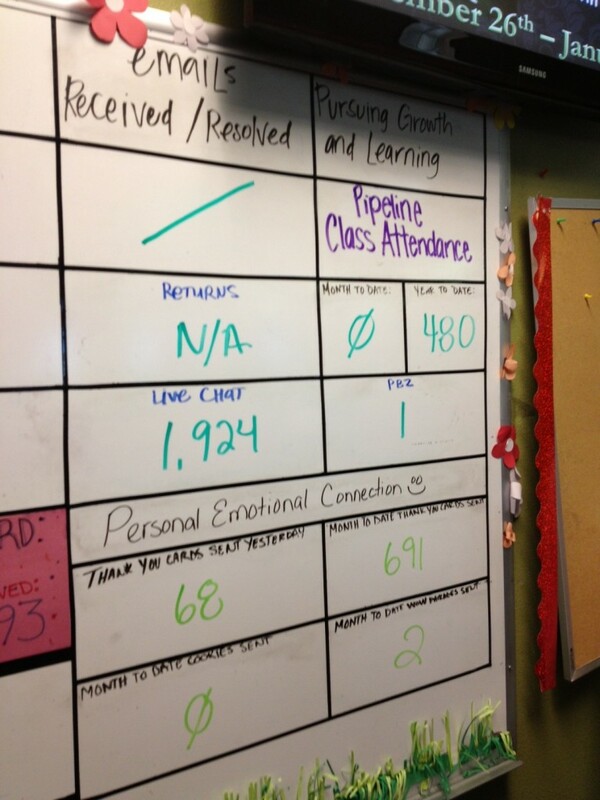 How great that employees feel so strongly about Zappos Values that they display them. You’ll see most of these Values crop up throughout this post. The tour focused on customer service and marketing with plenty of culture thrown in for good measure. It’s impossible to separate culture from almost anything Zapponian, as we quickly found out. 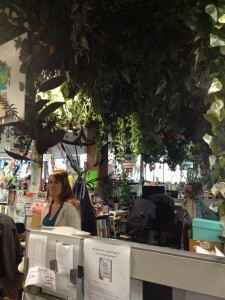 The walls, the stairwells, the cubicle jungles (everyone – and I mean everyone – works in a cubicle, as you’ll see) are all painted and decorated by employees. There’s no dress code. There are no rules about personal items on your desk. Food and drinks are free – and given gratis to thirsty tour-group members – with the exception of certain vending machines, like the Red Bull dispenser, though the money collected through these goes to Operation Smile, a nonprofit that helps children born with cleft lips and cleft palates. 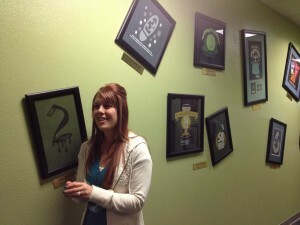 That’s our guide, Valerie, in the Zappos Hall of Fame. Photo by Vickie Bates. While there’s a goal of trying to respond to calls within 20 seconds (no one likes to hear endless ringing), there are no requirements about how long customer service reps can talk to callers. That’s right – and the longest call so far? Ten-and-a-half hours, according to Valerie. Problems walk the plank in this department. Photo by Vickie Bates. Most calls are handled by the regular customer service team members. They’re empowered to make magic happen for customers on the spot without having to escalate the call to someone more senior. 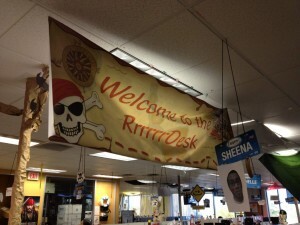 Really difficult calls that require research or calming down the rare irate customer go to the “Rrrrrrrrr Desk.” This section is tricked out in pirate booty. Zappos customer service team members are given time before their lunch breaks to write thank you notes to people they’ve talked to that morning. There are no set talking points, nothing they’re required to say, and they can decorate the cards any way they want. Talk about trust. And what happens when companies trust employees? That’s right: You boost engagement, morale and productivity. Teams consist of about 12 employees, and they switch teams every six months in an effort to build team and family spirit, said Valerie. In terms of “walking the talk,” I found it interesting that the white board Zappos uses to record each week’s call totals (see below) also features totals for thank-you cards sent and employee growth and learning classes. I’ve always believed that when you support employees with training, education and skill-building, you help them achieve their own goals, as well as the company’s, and you engage them at the same time. It’s win-win-win. Zappos call count board and much, much more. Photo by Vickie Bates. Zappos even offers employees sessions with a certified life coach to establish goals – personal or professional – create a plan for achieving them and receive support and encouragement along the way. Writing on the wall. 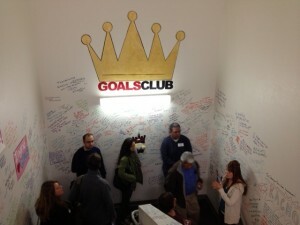 Zappos employees express their joy over meeting goals. Photo by Vickie Bates. One of the moving sights on the tour was this stairwell, where employees shared the goals they’ve achieved and everything they surmounted to get there. Some were about losing weight, gaining confidence, learning new skills. A graffito that really made me say, “Wow!,” mentioned creating an anti-bullying campaign at a child’s school. I mean, Wow! What a great personal goal, and how cool that a company would care enough to support an employee in its success. Monkey Row at Zappos. Where the senior leaders sit. Photo by Vickie Bates. Welcome to “Monkey Row,” where the guys who normally wear the monkey suits in a typical corporation sit. 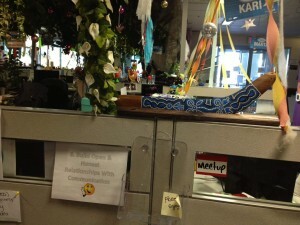 No one really dons formal-wear at Zappos, and even the CEO shares cubicle space with the rest of the gang. You can see the red and white “Tony Hsieh” sign in the center of the photograph, behind Valerie. With something like three tours a day moving through the Zappos hallways, it was amazing at how generous everyone was. Employees twirled noisemakers as we walked through their workspace, cheered, said “Hello,” and basically made us feel warmly welcomed. They answered all questions, were happy to have us take photos, and then gave everyone on the tour a free copy of the beautiful Zappos 2011 Culture Book. 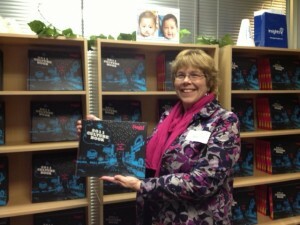 Yours truly with complimentary copy of the 2011 Zappos Culture Book. Photo by Rochelle Kanoff. Beyond the daily free tours, Zappos Insights also offers one-on-ones for a small fee, deeper dives at a higher rate, and multi-day boot camps. 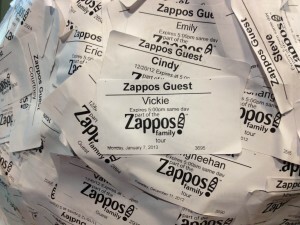 Why is Zappos so intent on giving away the “secret sauce,” you may ask? Not every company is willing to let that happen. Zappos tour name tag. Photo by Vickie Bates. If you’d like to learn more about the free tours or deeper dives, visit the Zappos Insights website or follow Zappos Insights on Twitter. A big “thank you” to the Insights Team and Valerie for the fascinating look inside the unique Zappos culture. 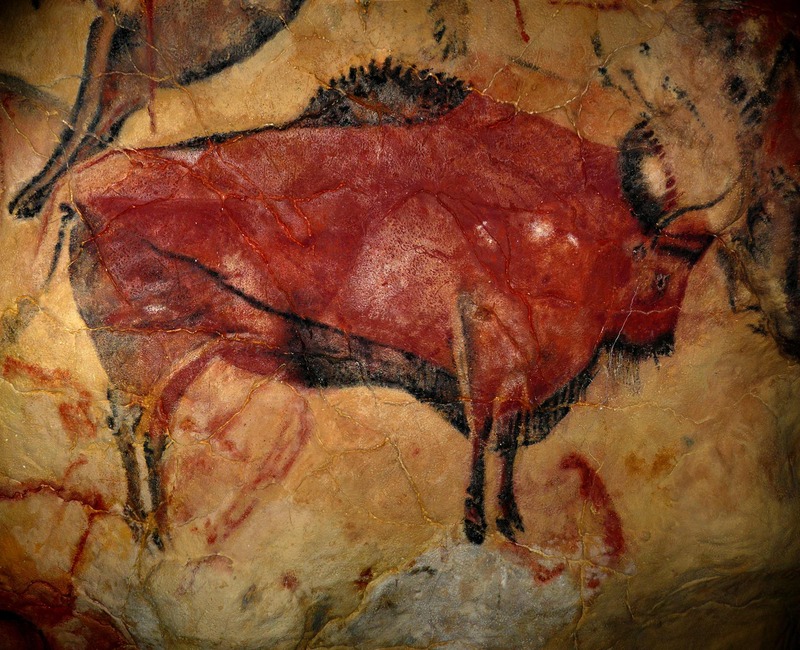 Bison from the Cave of Altamira in Spain, considered the Sistine Chapel of cave painting. Photo by Ramessos. Courtesy of Wikimedia Commons. From saber-tooth tiger-bait to link-bait, infographics have come a long way. Here’s a guide to their invention, how to use them effectively, and how to avoid infographics that add to the “contentification” of social media rather than offering real insight. There have been infographics in one form or another from the time human beings first applied paint to cave walls. The earliest probably promoted the best hunting grounds: number of wildebeest at the watering hole, likelihood of being devoured by a saber-toothed tiger, mysterious monolith sightings…your basic caveman data. Before there was writing, there were maps, as humans spread across the globe, traveling by land and sea. Then there were symbols signifying crops and livestock, illuminated church manuscripts, and the presentation of scientific data in graphs, histograms, bar and pie charts (which Florence Nightingale did not, as many have reported, invent). As the 20th century got going, infographics became ubiquitous. We used them as subway maps, street signs, in the morning newspaper, on PowerPoint slides at meetings, and to attempt to communicate with extraterrestrials. Today infographics rule the social media share-sphere. They substitute for press releases and resumes, white papers and detailed surveys – there is even an infographic about infographics. Webster is vice president of Strategy for Edison Research, which handles exit polling during U.S. elections. He understands that finding the right answers requires time (and money, too, if you need to hire a benchmarking firm to gather and crunch the data). What he’s describing is the scientific method, which provides objective, measurable, repeatable standards and techniques for investigating and gleaning information. Yes, this takes time, when all you wanted was a clever-looking infographic to share on your blog and Twitter. But advocating for what Webster only half-jokingly calls the “Slow Data Movement” isn’t about meeting a deadline on an editorial calendar, it’s about finding “better answers,” data you can be sure is credible when it’s out in public representing you, your brand and your company. While you’re at it, make sure you present the source of each piece of data on your infographic. Don’t distort data – Social media already amplify the “truth effect,” notes Webster. When you see the same information retweeted and shared to Facebook and LinkedIn, it starts to feel true simply because of amplification. Sketchy or overstated data in infographics can add a second layer of distortion. Remember that the recipients of infographics often are journalists trained to be skeptical of taking things at face value and well-versed in asking for data and details to back up assertions. You want to be able to stand – not hide – behind the work represented in your infographic. You don’t need someone who knows how to draw, you want to work with a designer savvy enough to translate concepts into compelling images. Dive deep into details using links – I’m not sure why so many infographics are static images. They’re designed to live on websites, blogs and social media, so why not capitalize on interactive capability and offer your readers links to far more detailed information – and log more page visits on your site? It’s this ability to show readers the complexity of your research that enhances your credibility. And, while you’re embedding those links, connect readers to more information about yourself, too. Share rather than promote – When you focus solely on content churn to feed an editorial calendar, what you miss is the purpose of social media. Conversation is the goal here – and that includes listening. Self-promotion is the byproduct, not the point, of good conversation. One of the best instigators of rousing two-way conversation is insight, with its power to grab attention, make the mind race, and challenge assumptions. This is what happens when you take the time to put real research behind an infographic; this is “turning data into insight, instead of chartjunk,” affirms Webster. On the technical level, make sure you offer an easy way for people to share your infographic and embed it into their own blogs and websites. Get all “CSI” on infographics before passing them along – Once you understand the difference between good research and chartjunk – and consider the fact that members of your audience distinguish these, as well – it may give you pause before hitting Retweet. Can you verify the facts? 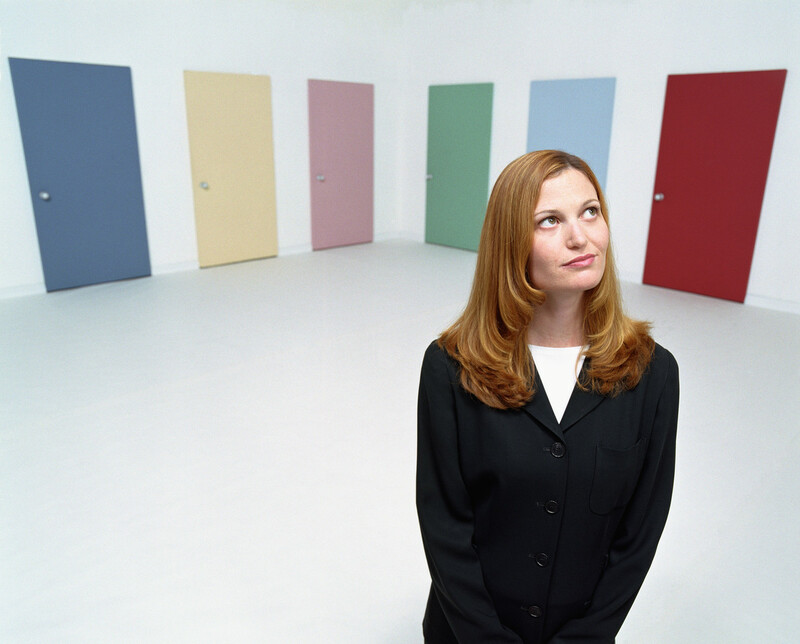 Are you even given the option (i.e., does the presenter provide data sources)? How sound is the study methodology? How large is the study population? How recent is the data? Is this something designed to promote rather than inform? How would I feel if I shared this infographic and then saw reputable sources refuting the data in the social media universe later? Insight drawn from verified data creates valuable visual information for your infographics, enlightens the social conversation, and enhances your own reputation as a content provider worth following.